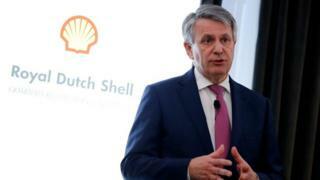 The chief executive of oil-company Shell saw his pay more than double last year to more than €20m (£17m). Ben van Beurden's total salary in 2017, which was approximately €9m, prompted a shareholder revolt. The raise comes as the company increased its annual profits by almost $10bn and is largely down to long-term incentives kicking in. Dutchman Mr van Beurden's pay is now 143 times larger than the average Shell employee in the UK. The firm's Remuneration Committee said the ratio was "consistent" with those in the top 30 companies listed in London. It added that Shell believed in reward packages "that are externally competitive and internally proportionate, meaning the chief executive is the employee with the highest proportion of variable pay as he has the highest level of responsibility". A report by the Chartered Institute of Personnel and Development (CIPD) found that the average FTSE 100 chief executive earned 167 times more than the average UK worker. The Anglo-Dutch giant is the most valuable company listed in Britain. Despite its ambition to halve its carbon footprint by 2050, the firm is one of the world's largest polluters, emitting 73 million tonnes on carbon dioxide (CO2) in 2017. Last year, Shell announced it would link executive pay to carbon emission targets, subject to a shareholder vote in 2020. The move followed pressure from investors, including the Church of England Pensions Board. In Thursday's report the firm said it was bringing that forward by a year and executive pay would be linked to carbon emission targets "with immediate effect". Mr van Beurden's pay has long been a matter of controversy. Many shareholders questioned why Shell executives were paid bonuses for 2017, the year in which a tanker run by a sub-contractor in Pakistan exploded, and killed more than 200 people. Luke Hildyard, the director of the High Pay Centre think tank, said Mr van Beurden's pay packet epitomised Shell's "flawed governance model and warped corporate culture". "They think that prosperity is bestowed by a small elite at the top, and everyone else should be thankful for what little they get. In fact, business success is a much more collective endeavour, and should be reflected in more equal, proportionate pay practices." Executive pay is a hotly debated topic in the UK. Last year, the boss of house builder Persimmon, Jeff Fairburn, was forced out after a row over his £75m pay award.